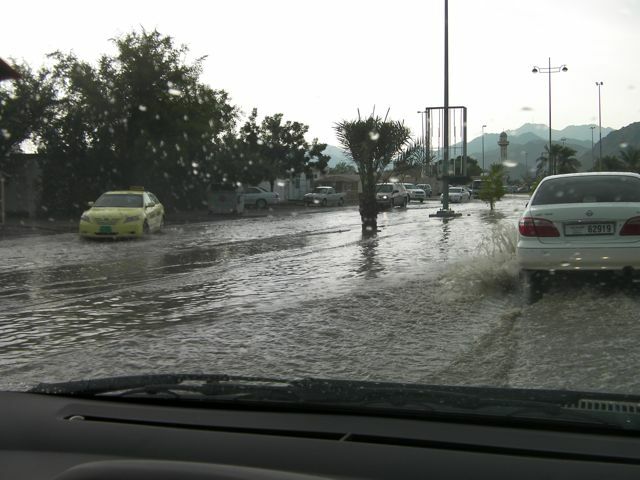 I finally got to enjoy a rain storm here in Fujairah. It happened suddenly at approximately 2:30 pm. Lightning, thunder, and torrents of rain for a goodly while. It was still raining, although more gently at 3:50 when I left work. Sand is not as absorbant as you would think. Basically, the top few inches get soaked and then turn into temporary cement, so this results in a lot of water not being absorbed causing large puddles. A flooded roundabout is a special kind of lake. (Sorry, no picture.) It slows people down, but doesn’t really improve their roundabout manners.